Profumo di Vulcano by Federico Graziani is a masterpiece of enology: obtained from mascarese nerello grapes and cap, and a few clusters of alicante and francisi. It ferments in a totally natural way and rests for at least 18 months in small wooden barrels, without decanting and filtering. Elegant and intriguing, with persuasive perfumes and refined sip. For the most important occasions. THE WINE Profumo di Vulcano by Federico Graziani It is obtained mainly from nerello mascalese and nerello cappuccio grapes, to which few clusters of alicante and francisi are added. It ferments without temperature control and only by indigenous yeasts, and rests for at least 18 months in small wooden barrels, without then being racked and filtered. The "Profumo di Vulcano" is a masterpiece of enology, son of the mind and hands of Federico Graziani, in the world of wine really well-rounded. It is an elegant and intriguing red, with persuasive perfumes and refined sip. To be reserved for the most important occasions, it is a red that conquers immediately ...: it is a red that makes you fall in love.. THE COMPANY Born in Ravenna in the mid-'70s, Federico Graziani is passionate about the world of wine since very young, to the point that already at 15 years, in 1990 to be exact, he attended his first course as a sommelier, starting a path that he will become a professional sommelier when he is only 19 years old. In 1998, then, the definitive consecration, with the victory, at 23, of the competition as "Best Sommelier of Italy". After only confirmation of a great talent, who began to work with the most important chefs and restaurateurs from across the Peninsula. And again, the writings, with the publication of the books "Grandi Vini di Piccole Cantine" and "Vini d'Autore". Then the science, with the enrollment and the following degree in viticulture and oenology, achieved in 2006. Since 2012 area manager, for the center-north of Italy, of the Feudi di San Gregorio, Federico Graziani is really an important character in the world of wine, among the few who can boast multi-faceted skills, knowledge and experience in many sectors of enology. Here then we could not miss the experience as a winemaker and producer, so we are directly along the slopes of Etna, in Castiglione di Sicilia, in the province of Catania, in the "Contrada Feudo di Mezzo" of Passopisciaro. We are about 700 meters above sea level: alberello-bred vineyards count on average 75-year-old plants, although it is not rare to find centenarian vines. Among the rows, the works are exclusively manual, neither pesticides nor systemic treatments are used, and the grapes know only copper and sulfur. Balanced, rich and concentrated bunches, reach the cellar to be enhanced by enhancing all the nuances that the season and the territory have shaped in the fruit. For fermentation we rely only on indigenous yeasts, while aging is performed in small wooden barrels never new, and does not last longer than 12-14 months. 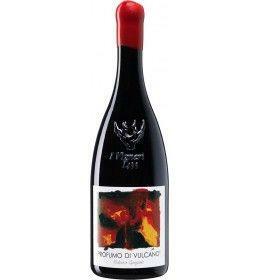 Thus was born the "Profumo di Vulcano", which together with the Rosso dell'Etna, represent the two labels that Federico Graziani currently produces. Two wines that tell the most beautiful stories of the good giant of Sicily, that volcano that, from an enological point of view, has been giving enormous satisfaction for years, and more and more will give it. Tasting Color: transparent and brilliant ruby red. Bouquet: broad, hints of currants, blueberries, raspberries, citrus and aromatic flavors. Taste: rich, tannic and lively, complex. 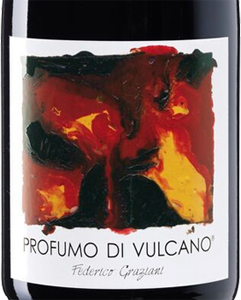 Profumo di Vulcano by Federico Graziani It is obtained mainly from nerello mascalese and nerello cappuccio grapes, to which few clusters of alicante and francisi are added. It ferments without temperature control and only by indigenous yeasts, and rests for at least 18 months in small wooden barrels, without then being racked and filtered. The "Profumo di Vulcano" is a masterpiece of enology, son of the mind and hands of Federico Graziani, in the world of wine really well-rounded. It is an elegant and intriguing red, with persuasive perfumes and refined sip. To be reserved for the most important occasions, it is a red that conquers immediately ...: it is a red that makes you fall in love..
Born in Ravenna in the mid-'70s, Federico Graziani is passionate about the world of wine since very young, to the point that already at 15 years, in 1990 to be exact, he attended his first course as a sommelier, starting a path that he will become a professional sommelier when he is only 19 years old. In 1998, then, the definitive consecration, with the victory, at 23, of the competition as "Best Sommelier of Italy". After only confirmation of a great talent, who began to work with the most important chefs and restaurateurs from across the Peninsula. And again, the writings, with the publication of the books "Grandi Vini di Piccole Cantine" and "Vini d'Autore". Then the science, with the enrollment and the following degree in viticulture and oenology, achieved in 2006. Since 2012 area manager, for the center-north of Italy, of the Feudi di San Gregorio, Federico Graziani is really an important character in the world of wine, among the few who can boast multi-faceted skills, knowledge and experience in many sectors of enology. Here then we could not miss the experience as a winemaker and producer, so we are directly along the slopes of Etna, in Castiglione di Sicilia, in the province of Catania, in the "Contrada Feudo di Mezzo" of Passopisciaro. We are about 700 meters above sea level: alberello-bred vineyards count on average 75-year-old plants, although it is not rare to find centenarian vines. Among the rows, the works are exclusively manual, neither pesticides nor systemic treatments are used, and the grapes know only copper and sulfur. Balanced, rich and concentrated bunches, reach the cellar to be enhanced by enhancing all the nuances that the season and the territory have shaped in the fruit. For fermentation we rely only on indigenous yeasts, while aging is performed in small wooden barrels never new, and does not last longer than 12-14 months. Thus was born the "Profumo di Vulcano", which together with the Rosso dell'Etna, represent the two labels that Federico Graziani currently produces. Two wines that tell the most beautiful stories of the good giant of Sicily, that volcano that, from an enological point of view, has been giving enormous satisfaction for years, and more and more will give it.